The canonizations of Popes John XXIII and John Paul II on April 27 are unusual in the sense that two popes will be declared saints in the same ceremony. 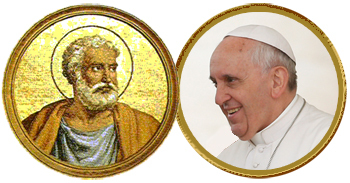 However, naming deceased popes as saints in the early church was virtually routine — especially in the first millennium. There have been 266 popes, give or take and depending on the list, starting with St. Peter. Of that number only two among the first 50 are not listed as saints. For some of them it was virtually automatic because they were martyrs. In some other cases, since almost all popes served until death, their canonization declaring that they were in heaven seems to have been the equivalent of a retirement gold watch. In the second half of the first millennium papal canonizations became much less common. The church never officially declares anyone has gone to hell, not even Judas Iscariot or Adolph Hitler. But the great Renaissance poet, Dante Alighieri, who may have had his own biases, suggested at least three of his near contemporary popes were either in hell or destined to hell. In the second Christian millennium canonizations of popes became unusual to the point that no pope after Pius V, who died in 1572, was canonized until Pius X, who died in 1914 and was canonized in 1954. Although John XXIII and John Paul II are the first to be canonized since Pius X, Popes Pius XII, Paul VI and John Paul I all have cause for canonization opened which may or may not come to fruition. Papal names are also interesting. While Simon was given the new name Peter by Jesus himself, the early popes who followed kept their birth name. The first to adopt a new name was John II (533-35) and it was understandable because his birth name Mercurio was a variation of Mercury and it wouldn’t do to have a pope named after a pagan Roman god. It wasn’t until the second millennium that adopting a new name as pope became the custom. Since many popes took the name of a distinguished predecessor there are a limited number of distinct papal names. Albino Luciano, as Pope John Paul I after his two immediate predecessors, was the first pope ever to adopt two names. His successor Karol Wojtyla followed as John Paul II. Last year, Jorge Bergoglio became the first pope in more than a thousand years to adopt a name that no other pope had ever chosen – Francis, which honors St. Francis of Assisi, an apt role model for any generation.